This Goat Cheese Pizza recipe has a creamy white sauce, zingy arugula, and loads of cheese. Pizza Friday just stepped it up a notch! In a small saucepan, heat butter and 1 Tbsp olive oil, then add minced garlic. Cook until garlic is light brown, then remove from heat and mix in Greek yogurt. Set aside. In a saute pan, heat 1 Tbsp oil, then place mushrooms in pan in single layer. Sprinkle with salt and cook for 7 minutes, adding in the sliced red onions for the last 2 minutes. Drain well. Brush olive oil onto dough, then spread on white sauce. Top with sauteed veggies and halved cherry tomatoes, followed by mozzarella cheese and goat cheese. Bake for 10 to 12 minutes at 475 degrees F on the lower rack, then move to a higher rack and broil for 2 minutes. Use clean scissors to cut pizza for an easy, fast cut! 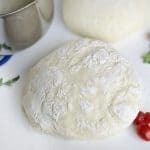 Recipe from Live Eat Learn at https://www.liveeatlearn.com/goat-cheese-pizza-with-arugula/.